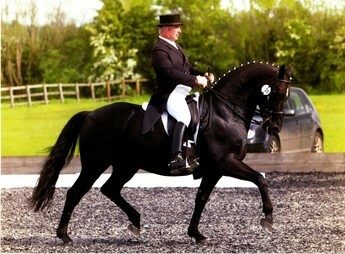 Wurlitzer's sire Weltmeyer is considered to be one of the best sires of dressage horses in Germany, producing top international horses including British team horse Wie Weltmeyer. Wurlitzer was bred at Sheepcote by Serena and David Pincus. Wurlizer started his competitive career as a 6 year old, at Medium level, and immediately made his mark. In September 2003, he started competing at Grand Prix level with David Pincus and gained 3rd place in his first attempt. Wurlitzer has subsequently enjoyed a very successful career at Grand Prix. Many of his progeny also produce excellent results in the competition arena. Sheepcote Whistle (out of Wurlitzer) is now competing at Grand Prix level.